Muriel Elizabeth Bowser (/ˈbaʊzər/; born August 2, 1972) is an American politician serving as the eighth mayor of the District of Columbia since 2015. A member of the Democratic Party, she previously represented Ward 4 as a member of the Council of the District of Columbia from 2007 to 2015. Elected to the Advisory Neighborhood Commission in 2004, Bowser was elected to the Council in a special election in 2007, to succeed Adrian Fenty, who had been elected Mayor. She was re-elected in 2008 and 2012 and ran for Mayor in the 2014 election. She defeated incumbent Mayor Vincent C. Gray in the Democratic primary and won the general election against three Independent and two minor party candidates with 54.53% of the vote. Bowser won re-election in 2018 with 76.4% of the vote. She is the second woman to serve as mayor, after Sharon Pratt Kelly. The youngest of six children of Joe and Joan Bowser, Muriel E. Bowser grew up in North Michigan Park in northeast D.C. In 1990, Bowser graduated from Elizabeth Seton High School, a private all-girls Catholic high school located in Bladensburg, Maryland. She received a college scholarship due to her above average grades. Bowser graduated from Chatham College in Pittsburgh, Pennsylvania, with a bachelor's degree in history, and she graduated from the American University School of Public Affairs with a Masters in Public Policy. In 2015, she bought a home in Colonial Village,  moving from a Riggs Park duplex where she had lived since 2000. She is a lifelong Catholic. Bowser says she never envisioned herself as a politician or mayor, but possibly as an agency administrator. Bowser began her political career in 2004, running unopposed for the Advisory Neighborhood Commission (ANC). She represented Single Member District 4B09, which includes the neighborhood of Riggs Park. She was unopposed again in 2006 when she ran for re-election for the position. Adrian Fenty, member of the Council of the District of Columbia representing Ward 4, ran for mayor of the District. Bowser was his campaign coordinator for Ward 4. When Fenty was elected mayor in 2006, a special election was called to fill his council seat. Bowser, among many others, announced her candidacy for it. During a political forum with 17 of the 19 council candidates in attendance, Bowser was the only candidate present who supported Fenty's proposed takeover of the District public school system, saying that the school system needed to change. 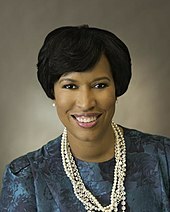 When Fenty announced his support of Bowser, some critics claimed that, if elected, she would always vote as Fenty wished, ignoring the needs of her constituents. Other critics took note of developers who had contributed to Bowser's campaign, claiming she would favor developers over her constituents. While an ANC commissioner, Bowser had voted in favor of a zoning variance for a condominium development to be built by a developer who had contributed several hundred dollars to her campaign, which some critics derided as a conflict of interest. Bowser maintained that she had supported the development project before running for Council. The editorial page of The Washington Post favored Bowser in the election. The local councils of the AFL-CIO, Service Employees International Union, and the Fraternal Order of Police also endorsed Bowser in the election, but the American Federation of State, County and Municipal Employees endorsed her opponent, Michael A. Brown. Bowser won the special election with 40% of the vote. In 2008, Bowser announced her reelection campaign for the Council. Three individuals ran against her in the Democratic primary, namely: Baruti Akil Jahi, former president of the Shepherd Park Citizens Association; Malik Mendenhall-Johnson, then serving as Advisory Neighborhood Commissioner of 4B04; and Paul E. Montague, who had been Advisory Neighborhood Commissioner of 4B07 before being recalled in 2004. Both Jahi and Mendenhall-Johnson criticized Bowser, saying she was a rubber stamp for Mayor Fenty and that she was unconcerned with her constituents' needs. No candidates' names were on the ballot for the Republican or D.C. Statehood Green primaries. The Washington Post's editorial department endorsed Bowser's candidacy. The Gertrude Stein Democratic Club also voted to endorse Bowser's reelection. Bowser won the Democratic Party primary election, receiving 75 percent of votes. Jahi received 19%, Montague received 3%, and Mendenhall-Johnson received 2%. With no one else appearing on the subsequent general election ballot, Bowser won the general election with 97 percent of the vote. In 2011, Bowser was appointed to the Washington Metropolitan Area Transportation Authority board of governors, a position she held until 2015. Bowser ran for reelection in 2012. Bowser said she would not turn down donations from corporations. Candidate Max Skolnik criticized Bowser for receiving campaign contributions from developers, corporate bundlers, and lobbyists, saying that Bowser would favor the interests of these corporate donors. Bowser said she was not in favor of banning corporations from making political donations altogether, saying that doing so would make it more difficult to track where campaign donations come from. She also said that corporations are banned from donating to federal elections, but that corporations still find ways to give to campaigns. Bowser's candidacy was endorsed by the editorial boards of the Washington Post and the Washington City Paper. Bowser won the Democratic primary with 66% of the vote, to Renee L. Bowser's (no relation) 13%, Max Skolnik's 9%, Baruti Jahi's 5%, Judi Jones' 3%, and Calvin Gurley's 2%. Unopposed in the general election, she was elected with 97% of the vote. On March 23, 2013, Bowser announced that she would run for Mayor of the District of Columbia in the 2014 election. Her campaign's chair was former council member William Lightfoot. Bowser emphasized that she can connect with longtime residents concerned about the rapid changes occurring in the District, while still celebrating the changes that had occurred. Bowser disdained business-as-usual and corruption in the District's government. She favored free Metro fares for students. She was against increasing for the minimum wage only for employees of large retailers. Bowser was criticized for being too inexperienced for the position, with too few legislative accomplishments while on the Council, and for having a platform that was short on details. She limited the number of debates by only agreeing to participate after the field of candidates had been set, which postponed the first debate until August. Bowser was endorsed by EMILY's List and the editorial board of The Washington Post. She won the Democratic mayoral primary election with 43 percent of the vote. To raise funds for her campaign she accepted contributions in excess of legal limits, for which she was fined after winning the election. In the general election, Bowser was on the ballot with Independents David Catania, Nestor Djonkam and Carol Schwartz, D.C. Statehood Green Faith Dane and Libertarian Bruce Majors. No Republican filed. Bowser won the election with 80,824 votes (54.53%) to Catania's 35% and Schwarz's 7%, and took office on January 2, 2015. In 2017, Bowser proposed several animal regulations, including a ban on backyard chickens, a requirement that all cats be licensed, and a provision that seemed to outlaw leaving dog feces in private yards for more than 24 hours. Following public backlash, the City Administrator clarified that "this is not a war on pets" and the proposals were withdrawn. Later the same year, the Department of Health began to enforce an existing law banning dogs from outdoor bar patios. Following public objections, the DC Council changed the law to allow business owners to decide whether or not to allow dogs. In February 2018, Bowser announced the formation of a work group, with members drawn from various agencies, to explore the benefits of, and prepare the District for, autonomous vehicle technology. The city and the Southwest Business Improvement District are also exploring possibilities for a pilot shuttle program along 10th Street, S.W., possibly to supplement an existing service that connects visitors to popular District destinations. A "Request for Information" was released to firms with expertise in autonomous vehicle development. Bowser released the first budget of her second term in March 2019. The budget increased spending by 8.2 percent though revenue growth was expected around three percent. DC Auditor Kathy Patterson said the budget was not sustainable and fiscally irresponsible. Bowser responded by hailing her plan to make the DC Circulator free of charge. In 2015, Bowser's allies formed FreshPAC, a political action committee intended to advance her agenda. The initiative was the first PAC in District politics so closely aligned with a sitting mayor and created by a former campaign treasurer. Thanks to a legislative loophole regulating off-year fundraising, FreshPAC accepted unlimited contributions. Bowser supporters had quickly raised more than $300,000 and had a goal of collecting $1 million by year's end. FreshPAC was chaired by Earle "Chico" Horton III, a lobbyist for a major corporation that sought Bowser's support. Many of the highest donors participated in a trip to China with the mayor. Following outcry from the Washington Post, members of the D.C. Council, and other stakeholders, FreshPAC was shut down in November 2015. Bowser said she thought FreshPAC was a good thing but its message was distorted. In 2017, the D.C. Office of Campaign Finance fined Bowser's campaign committee $13,000 for accepting contributions beyond legal maximums during her 2014 mayoral campaign. The excess contributions totaled more than $11,000 from more than a dozen developers and contractors, as well as from landlord Sanford Capital, whom the Bowser administration had been slow to fine despite being responsible for more than 1,000 housing code violations. Some of the same contributors later contributed to FreshPAC. Bowser's campaign returned the illegal contributions. In 2018, the D.C. Council unanimously passed campaign finance legislation that sought to remove the influence of developers and other large donors from politics by publicly financing campaigns. Bowser was staunchly opposed to the act and said that she would not provide financing for implementation of the law. In 2016, the head of D.C.'s Department of General Services resigned and contracting officials were fired following the award of a large construction project. One of the fired employees filed a $10 million whistleblower lawsuit alleging that he had been terminated for the failure to channel contracts to Fort Myer Construction, a major Bowser campaign donor; the other made similar allegations in an administrative proceeding. The episode prompted an investigation by Councilmember Mary Cheh. In 2017, Cheh's report found that in addition to the questionable firings, a city employee had illegally shared confidential information with Fort Myer about a competitor's bid on a separate project. The report found that the D.C. City Administrator - the top Bowser appointed official - had urged quick settlement of unresolved contract disputes with Fort Myer in an attempt to appease it. These actions led to a $4 million in payouts to the firm, an outcome that the District has previously opposed. After fighting unsuccessfully to keep the findings from public view, Bowser refused to comment on any of the points in the report. During her first year as Mayor, the District saw a 40% increase in homicides. Bowser sought to address the spike by proposing legislation allowing law enforcement officials to perform warrantless searches of violent ex-offenders. The bill was widely opposed by citizen's groups and the D.C. Council, and did not pass. In 2016, District homicides fell by 17%, to 135, and dropped again in 2017 to 116, or about the same level prior to a 2015 spike. There were 160 homicides in 2018, an increase of 40 percent from the previous year and the most since 2015. In February 2015, Bowser cancelled the creation of a public facility for art exhibitions, lectures and educational activities by the Institute for Contemporary Expression. Approved by Gray, the project involved a privately funded conversion of the historic but unused Franklin School and had its first event planned for September 2015. Bowser cited financial concerns for the decision, but critics noted that several of the firms who earlier competed unsuccessfully for the property were among her donors. As of October 2015, proposals were still being considered. In September 2015, Bowser announced a deal with Monumental Sports owner Ted Leonsis to build a practice facility for the Washington Wizards. Under the deal, District taxpayers would pay 90 percent of the estimated $55 million cost. The government's portion was split between direct government expenditure and Events DC, a DC-government funded body which operates with an independent board. In July 2016, before construction had started, it was announced that costs would exceed estimates by $10 million while the number of seats in the facility would likely decrease. Under the agreement with the developer, the District will be responsible for cost overruns. A proposed bill to cap spending on the facility did not pass the Council. In 2015, D.C. Public Schools Chancellor Kaya Henderson routinely bent or broke school placement rules to give preferential treatment to well-connected parents seeking prized enrollments at particular DC public schools. Two senior Bowser appointees were among seven parents who benefited from Henderson's misuse of authority by being permitted to bypass the competitive DCPS lottery system. Deputy Mayor Courtney Snowden, who makes $196,000 a year, jumped a waitlist of more than 1000 names to enroll her child. In 2018, it was revealed that Bowser's recently appointed Schools chancellor Antwan Wilson had similarly manipulated the system to transfer Wilson's teenage daughter to a preferred school. Wilson and other staff resigned while Bowser refused a request to testify about Wilson's statement that she was aware of the placement, calling an inquiry "political circus". By 2018, management of D.C. Public Schools prompted investigation by the Federal Bureau of Investigation, the U.S. Department of Education and the D.C. Office of the Inspector General. In February 2016, Bowser's appointee as medical director of the fire department resigned from her post after one year on the job. Explaining her decision, Jullette Saussy said that she could not be complicit in a failed agency and that its performance was putting Washingtonian's lives at risk. In response, Bowser's spokersperson said that she was committed to achieving change. In January 2018, Bowser announced a $4.7 million investment in two islands in the Anacostia River, 45 acre Kingman Island and 5 acre Heritage Island. She also designated portions of each island as a "state conservation area", which restricts their use to limited purposes including recreation and education. The funds will be used for improvements to the islands, including outdoor classrooms, walkways, a floating lab platform and bathrooms. In early 2018, the members of the D.C. Board of Ethics and Government Accountability voted unanimously not to renew the contract of Traci Hughes, head of D.C.'s government transparency entity, the Office of Open Government. Activists said Hughes was being punished for her enforcement of District regulations on government transparency. In the preceding year, she had faulted at least two public boards controlled by Bowser appointees for failure to comply with the city's Open Meetings Act, and had issued a decision that the board of United Medical Center, the District's troubled public hospital, had broken that law by secretly discussing and voting to close the facility's nursery and delivery rooms. Hughes said after her dismissal that she had had to resist pressure to ease off in her role of policing District agencies' compliance with the Open Meetings Act and Freedom of Information Act; and that she had been subjected to "personal attacks in an effort to keep [her] from issuing an opinion" relating to Open Meetings Act compliance by the D.C. Commission on Selection and Tenure of Administrative Law Judges. Bowser is a strong advocate of gun control, characterizing herself in her Inaugural Speech in January 2015 as "a mayor who hates guns". Bowser has encouraged the D.C. Council to ban bump stocks, with the aim of forcing congressional Republicans to take a stand on the record on gun control and gun violence. Bowser was also "unusually supportive" of the March for Our Lives rally in Washington, D.C. in March 2018, and is said to be positioning herself as a national figure in the gun control movement. The opioid epidemic ravaged DC, with a higher rate of fatal overdoses in 2017 among African Americans in DC than whites in West Virginia or New Hampshire. Though funding was available, the Department of Behavioral Health failed to establish adequate treatment programs. In December 2018, the District announced an "ambitious" plan aiming to cut opioid deaths by half within about two years, using a combination of treatment, tracking and education. The plan was written by a "group of D.C. agencies, doctors, substance abuse treatment providers, council members and individuals in recovery". Several of the plan's recommendations were described as "vague", or merely expanding on existing programs. Bowser pledged to end chronic homelessness in the District. In 2018, the results of an annual survey required by federal law reflected a 7.6% drop in the homeless population from 2017, following a 17.3% drop the year before. The estimated total homeless population of 6,904 was, however, still slightly higher than it had been in 2013. Bowser's approach to resolving the homelessness issue, focusing on homeless families, has been the subject of criticism. During the winter of 2015, the District saw an increase of more than 250 percent over any previous year, in homeless families housed in shelters and overflow motel rooms, although part of the increase was due to the administration's decision to move families into motel rooms before freezing temperatures would require it do so under the law. In February 2016, Bowser unveiled a plan to provide housing for homeless families following the closure of DC General. Without any community consultation or input, Bowser announced the location of one shelter in each of the District's eight wards and refused to say how the sites were selected. In March 2016, it was revealed that many of the sites selected were connected to Bowser's contributors. Under Bowser's plan, the monthly cost per unit was $4,500 on average each year for at least the next 20 years. Frustrated by the DC Council's efforts to devise its own plan, Bowser lashed out with expletives at Chairman Phil Mendelson. In 2018, Bowser nominated Joshua Lopez, former chief campaign aide to both Bowser and ex-Mayor Adrian Fenty, to serve on the board the DC Housing Authority, which reviews contracts and sets policy for public housing. Over the objections of certain council members who considered Lopez unqualified for the position, Bowser proceeded with the nomination, which the Council approved by a vote of 10-3. In April 2018, Lopez held a loudspeaker at a rally while a representative of the Nation of Islam spoke, calling Councilmember Elissa Silverman "a fake jew". Bowser called upon Lopez to apologize but resisted public calls for his resignation. Upon the election of Donald Trump to the presidency, and following statements by the President-elect threatening to pull federal funding from sanctuary cities, Bowser issued a statement reaffirming the District's status as a sanctuary city. Soon thereafter Bowser was confronted by a throng of about 100 protesters who were angry that she had not responded more forcefully—as had mayors of some other sanctuary cities—in denouncing Trump's policies and in defending immigrants. In January 2017, following Trump's inauguration and the issuance of a Presidential Executive Order threatening to withhold Federal funding from sanctuary cities, Bowser affirmed that the District would maintain its status as such. In November 2017, Bowser announced that the District was joining seven other cities in a partnership with the National Immigration Forum to assist some 2,000 green card holders who work for the DC Government, as well as family members, in applying for U.S. citizenship. The partnership would provide information, legal help, citizenship test coaching and assist in finding language classes. Participation in the program could save an applicant as much as $2,000 in legal fees. In January 2016, traffic throughout the DC region was paralyzed by an inch of snow on untreated roads. More than 1,000 accidents were reported and some commuters abandoned their cars amidst impassable roads. Bowser apologized for an inadequate response in the District, explaining that "we should have been there earlier". For a larger storm later in the same season, a report by the DC auditor found that the District had spent over $40 million on removal, much of it charged to the District's credit cards. The District incurred tens of thousands of dollars in credit card fees. In an unprecedented move, JPMorgan Chase shut off the government's line of credit until some of the card balances could be paid. Some of the contractors who benefited most from the snow removal expenses were important Bowser donors, the DC auditor found. In October 2015, Bowser changed her position to support the $6.4-billion merger between two public utilities, Exelon and Pepco. Opponents of the merger decried the lack of transparency in the deal and Bowser's reversal. Community activists raised ethics concerns, claiming that Bowser was swayed by a $25 million pledge to rename the future MLS Soccer Stadium as Pepco Park. In December 2015, it was revealed that Exelon had paid the chairman of FreshPAC, a political action committee affiliated with Bowser's allies, as a lobbyist. In December 2017, Bowser ordered that 30,000 employees of the District receive sexual harassment training by February 2018. Under the order, 1,500 supervisors must also complete advanced, in-person training. At the time, Bowser administration personnel could not say how much taxpayers had paid to resolve sexual harassment claims against the city, or how many such claims there had been. In March 2018, it was reported that taxpayers had recently spent at least $735,000 to settle such suits. Bowser's aides acknowledged they did not have a full grasp of the problem, and the city plans to set up a system to track complaints and settlements. In 2015, Bowser announced Vision Zero, a traffic safety initiative that aims to eliminate all traffic fatalities by 2024. To launch the event, Bowser, supporters, and DC government employees stood at intersections and waved green signs imploring motorists to slow down. The following year, the number of traffic fatalities increased from 26 to 28 and the number of crash injuries increased from 12,122 to 12,430. Pedestrian fatalities within the total dropped from 15 to 9, during a period when pedestrian deaths nationally had jumped upward by 11 percent. In 2017, traffic fatalities continued to rise. Following a pair of biking fatalities in the summer of 2018, cyclists protested that Bowser had failed at promoting traffic safety. As part of her first State of the District Address in March 2015, Bowser promised to get the DC Streetcar "up and running". In September, Bowser as well as the director of the DC Department of Transportation promised that the streetcar would be operational by the end of the year. The H Street/Benning line eventually began public service operations on February 27, 2016. After Bowser took office in 2015, she created a new cabinet post to focus on development in the city's poorest areas. She named former Council candidate Courtney Snowden to the new position. In 2017, the Inspector General found that Snowden had improperly used city employees to care for her child. Bowser said that appropriate management action had been taken in response to staff babysitting, without specifying what was done. In October 2017, Bowser announced a $3 million infusion into housing and retail projects in DC Wards 7 and 8 in an effort to remedy the scarcity of grocery stores in the District's poorest wards. District Wards 7 and 8 have only three grocery stores between them, or 50,000 people for every grocery store, compared to 10,000 per store in wealthy Ward 3. Bowser awarded $2.1 million to the Jair Lynch group for redevelopment of a shopping center, and $880,000 to South Capitol Affordable Housing to assist in building out the Good Food Markets project, which also includes 195 units of affordable housing as well as commercial space. Previous attempts to attract grocery stores to these areas have failed. In April 2016, the DC Trust, a government-funded entity that disbursed grants throughout the District to non-profits providing youth services, declared bankruptcy and announced plans to dissolve. The decision was attributed in part to overspending by and for staff at the agency. The agency, also known as the City Youth Investment Trust Corp., had suffered a history of abuse and mismanagement. Former councilmember Harry Thomas, Jr. was found guilty on felony charges for embezzling $350,000 of the trust's funds between 2007 and 2009. In 2013, Congressional investigators concluded that the agency lacked controls to properly administer a $20 million-a-year, federally funded school-voucher program. Then in January 2016, the agency's board, four of whom had been appointed by Mayor Bowser, learned that a former executive director and a former senior financial officer had used funds to pay tens of thousands of dollars in credit-card charges, including some for personal use. Bowser had recently provided $700,000 in taxpayer funding to the agency. The board members did not know how much of the funding remained or how youth services could be continued. Bowser supports the outfitting of Metropolitan Police Department with body cameras and has requested $6 million in her 2016 budget proposal to complete the task. Her proposal includes a provision that would make all footage from the cameras exempt from Freedom of Information Act requests, with the goal "to respect privacy". Bowser filed to run for reelection in 2018. James Butler, Ernest E. Johnson, and Jeremiah D. Stanback filed to run against her in the Democratic Party primary election. Ann C. Wilcox filed to run as a D.C. Statehood Green Party candidate. No one filed as a mayoral candidate in either the Republican Party primary election or the Libertarian Party primary election. Noting the nominal opposition and some "stumbles" during her first term, the Washington Post endorsed Bowser's re-election, citing the District's economic prosperity and Bowser's having fulfilled her promise to restore integrity to government. She then won the June 19 Democratic Primary with 80% of the vote. Bowser sought to unseat incumbent Councilmember Elissa Silverman, who had frequently questioned the Mayor. Bowser endorsed political newcomer Dionne Reeder and provided her with volunteer and fundraising support. Reeder lost by a significant margin and Bowser was not able to deliver a victory in her home base of Ward 4. In May 2018, Bowser announced that she had adopted a baby. ^ DeBonis, Mike (March 4, 2014). "Five things you don't know about Muriel Bowser, promising 'fresh start' as D.C. mayor". The Washington Post. ^ Stewart, Nikita. In Primary, Bowser Asserts Independence. The Washington Post. August 20, 2008. Retrieved August 20, 2008. ^ "Annual Report, 2006-2007" (PDF). Elizabeth Seton High School. Archived from the original (PDF) on September 10, 2008. ^ "Elizabeth Seton: Class of 1990". The Washington Post. June 14, 1990. p. MD11A. ^ Harriston, Keith (May 19, 1990). "Academics Pay Off for Teen Individualists". The Washington Post. p. B1. ^ Local elections 2008: Muriel Bowser. The Washington Post. Retrieved June 27, 2008. ^ Neibauer, Michael (January 4, 2016). "Here's what Mayor Muriel Bowser paid for her new home". Washington Business Journal. Retrieved January 4, 2016. ^ Suderman, Alan (April 26, 2013). "Muriel's Vetting". Washington City Paper. ^ Drake, Ingrid. Possible Contenders in the Ward 4 Race (pdf). DC North. January 2007. ^ a b Jaffe, Harry (September 24, 2014). "Muriel Bowser Is No Adrian Fenty". Washingtonian. ^ a b Certified Summary Results (pdf). District of Columbia Board of Elections and Ethics. November 18, 2004. ^ a b Woodlee, Yolanda; Silverman, Elissa. "Hopefuls Begin Staking Out Fenty's and Gray's Seats", The Washington Post. September 20, 2006. ^ Ward 4 with ANC & SMD Boundary. District of Columbia Board of Elections and Ethics. Retrieved June 30, 2008. ^ a b "Certified Official Results Report". District of Columbia Board of Elections and Ethics. November 21, 2006. Archived from the original (pdf) on November 30, 2006. ^ a b Silverman, Elissa. Fenty a Strong Presence in Crowded Ward 4 Race to Replace Him. The Washington Post. January 23, 2007. ^ Silverman, Elissa; Woodlee, Yolanda. Fenty's School Takeover Plan Gets Rough Reception. The Washington Post. March 2, 2007. ^ Chen, Eve. Fenty Supports ANC Commissioner as Successor. WTOP. January 21, 2007. ^ Woodlee, Yolanda. Candidates Focus On Fundraising In Wards 4, 7, The Washington Post. March 6, 2007. ^ a b Woodlee, Yolanda. Top Fundraisers Feel The Heat in Ward 4. The Washington Post. April 27, 2007. ^ Woodlee, Yolanda; Silverman, Elissa. Who Will Fenty Support in Ward 7?, The Washington Post. March 8, 2007. ^ The D.C. Special Election: Muriel Bowser in Ward 4 and Victor Vandell in Ward 7 are the best bets for council. The Washington Post. April 15, 2007. ^ Muriel Bowser Receives the Metropolitan Council, AFL-CIO Endorsement (pdf). Muriel Bowser for Ward 4 2008. Press release. April 10, 2007. ^ Silverman, Elissa; Labb, Theola. Dueling Endorsements for Vacant Seats. The Washington Post. March 22, 2007. ^ Muriel Bowser Endorsed By The Fraternal Order of Police, Metropolitan Police Department Labor Committee (pdf). Fraternal Order of Police, Metropolitan Police Department Labor Committee. Press release. March 15, 2007. ^ a b Certified Official Results Report (pdf). District of Columbia Board of Elections and Ethics. May 11, 2007. ^ a b List of Candidates for the September 9, 2008 Congressional and Council Primary Election (pdf). District of Columbia Board of Elections and Ethics. July 3, 2008. ^ Stewart, Nikita. Local Election Season Quietly Kicks Off. The Washington Post. May 11, 2008. ^ Advisory Neighborhood Commission 4B. Government of the District of Columbia. Retrieved July 15, 2008. ^ Stewart, Nikita R. And They're Off! The Washington Post. May 11, 2008. ^ Stewart, Nikita. "In Primary, Bowser Asserts Independence". The Washington Post. August 20, 2008. Retrieved September 10, 2008. ^ "The D.C. Council Primary: Our choices in next Tuesday's election". The Washington Post. September 3, 2008. Retrieved September 10, 2008. ^ DeBonis, Mike. Incumbents Rake In Stein Club Endorsements. Washington City Paper. June 19, 2008. ^ a b c Certified Results. District of Columbia Board of Elections and Ethics. September 26, 2008. ^ "List of Candidates in Ballot Order for the November 4, 2008 General Election" (PDF). District of Columbia Board of Board of Elections and Ethics. ^ a b Certified Results. District of Columbia Board of Elections and Ethics. November 24, 2008. ^ a b c d Suderman, Alan (January 20, 2012). "Bowser Defends Corporate Giving, And Lots of It". Washington City Paper. ^ Stewart, Nikita (March 8, 2012). "Bowser looks to be bouncing back". The Washington Post. p. B1. ^ "Our choices for D.C. Council" (editorial). The Washington Post. March 18, 2012. p. A20. ^ Schaffer, Michael (March 21, 2012). "Vote This Way on April 3!". Washington City Paper. ^ a b "Council Primary Official Results" (PDF). District of Columbia Board of Elections and Ethics. April 19, 2012. ^ Suderman, Alan (July 30, 2012). "How Many People Does It Take to Host a Party?". Washington City Paper. ^ a b Certified Results. District of Columbia Board of Elections and Ethics. November 6, 2012. ^ DeBonis, Mike; Stewart, Nikita (March 23, 2013). "Muriel Bowser launches bid for D.C. mayor". The Washington Post. ^ Noble, Andrea (April 16, 2014). "Minority parties see power grab for D.C. vote". The Washington Times. Archived from the original on April 19, 2014. ^ a b c DeBonis, Mike (March 4, 2014). "Muriel Bowser tries to escape Fenty's shadow, other Gray challengers in D.C. mayor race". The Washington Post. ^ DeBonis, Mike (June 26, 2013). "Sales tax cut likely to get D.C. Council's okay". The Washington Post. ^ DeBonis, Mike (June 27, 2013). "Higher minimum pay nearer in District". The Washington Post. p. B1. ^ McCartney, Robert (February 10, 2014). "Muriel Bowser seems to be the candidate to beat among rivals to D.C. Mayor Vincent Gray". The Washington Post. ^ Barras, Jonetta Rose (September 10, 2014). "Muriel Bowser runs for mayor, ready or not" (editorial). The Washington Post. ^ King, Colbert (September 10, 2014). "Muriel Bowser runs for mayor, ready or not". The Washington Post. ^ Freed, Benjamin (February 25, 2013). "Political Groups Line Up to Endorse DC's Mayoral Candidates, Real and Hypothetical". Washingtonian Magazine. ^ "Muriel Bowser for District Mayor" (editorial). The Washington Post. February 20, 2014. ^ DeBonis, Mike (April 2, 2014). "Muriel Bowser wins". The Washington Post. ^ a b Davis, Aaron (June 8, 2017). "D.C. Mayor Bowser fined $13,000 for illegal campaign contributions". Washington Post. Washington DC. Retrieved December 8, 2017. ^ "Sample Ballot, General Election, November 4, 2014" (PDF). District of Columbia Board of Elections. 2014. Retrieved October 15, 2014. ^ DeBonis, Mikie; Davis, Aaron C. (November 5, 2014). "Bowser is elected D.C. mayor, defeating independents Catania and Schwartz". The Washington Post. ^ a b Jamison, Peter (May 11, 2017). "'This is not a war on pets': D.C. mayor backs off proposed chicken ban". Washington Post. Washington DC. Retrieved May 11, 2017. ^ Jamison, Peter (October 1, 2017). "D.C. tries to ban dogs from bar patios, and lawmakers bite back". Washington Post. Washington DC. Retrieved October 1, 2017. ^ Chason, Rachel (October 3, 2017). "Dc Politics After howls of protest, pups can return to restaurant patios in D.C." Washington Post. Washington DC. Retrieved October 3, 2017. ^ D.C. Mayor Muriel E. Bowser lays out the welcome mat for self-driving cars, Washington Post, February 13, 2018. ^ Henry, John (March 26, 2019). "DC Auditor: Mayor Bowser's budget proposal 'not sustainable'". WTOP. Washington DC. Retrieved March 26, 2019. ^ Jamison, Peter (March 25, 2019). "D.C. auditor says mayor's budget is 'not fiscally responsible'". Washington Post. Washington DC. Retrieved March 25, 2019. ^ a b Davis, Aaron C. (October 20, 2015). "Divided D.C. Council takes aim at Mayor Bowser's super PAC". The Washington Post. ^ a b Davis, Aaron C. (November 11, 2015). "D.C. mayor's allies reluctantly shut down controversial PAC". The Washington Post. ^ "FreshPAC's chairman lobbying for Exelon was legal, but unseemly". The Washington Post. December 18, 2015. ^ Davis, Aaron C. (November 7, 2015). "D.C. mayor's delegation to China includes some top PAC contributors". The Washington Post. ^ Holman, Craig (April 15, 2016). "There's nothing to fear in fair elections". The Washington Post. ^ a b Chason, Rachel (January 9, 2018). "D.C. Council unanimously votes to create public campaign finance program". The Washington Post. ^ a b Chason, Rachel (January 5, 2018). "Mayor Bowser and D.C. Council at odds over public campaign financing". The Washington Post. ^ Nirappil, Fenit (December 8, 2016). "Whistleblower suit: D.C. employee fired after refusing to steer contracts to Bowser donor". The Washington Post. ^ Davis, Aaron (June 14, 2017). "D.C. Council report: Bowser administration favored top donor in contracting". The Washington Post. ^ Jamison, Peter (June 15, 2017). "Bowser says she will not investigate evidence of illegal leak in contracting process". The Washington Post. ^ a b Davis, Aaron (October 21, 2015). "D.C. mayor's plan for 'warrantless searches' appears dead on arrival". WashingtonPost.com. Retrieved October 22, 2015. ^ Michelle Basch, Michelle (May 15, 2018). "DC's top cop predicts 'good summer' despite rise in homicides". Retrieved May 15, 2018. ^ "D.C.'s homicide rate is spiking. The city must take action". Washington Post. October 11, 2018. Retrieved October 11, 2018. ^ "Homicides spike in District as shootings become more lethal, police say". Washington Post. Washington DC. December 31, 2018. Retrieved October 11, 2018. ^ a b Kennicott, Philip (November 11, 2015). "A setback for D.C. arts and culture, years in the making". The Washington Post. ^ Capps, Kriston (February 13, 2015). "Six Reasons Bowser Should Reconsider Pulling ICE from the Franklin School". The Washington City Paper. ^ Clabaugh, Jeff (October 23, 2015). "D.C. receives new proposals for historic Franklin School". Washington Business Journal. ^ a b Sommer, Will (September 15, 2015). "Taxes Will Fund 90 Percent of Wizards Practice Site". washingtoncitypaper.com. ^ Pyke, Alan (March 22, 2016). "Taxpayer-Backed Arena Deal Gets New Scrutiny Amid Radical Housing Shortage". Thinkprogress.org. ^ O'Connell, Jonathan (July 28, 2016). "Cost of Wizards practice facility rises $10 million before construction can even begin". Washington Post. ^ Jamison, Peter (May 10, 2017). "Second mayoral appointee identified in school-lottery scandal". The Washington Post. Washington DC. Retrieved September 17, 2017. ^ Jamison, Peter (May 17, 2017). "Secret report shows 'special' treatment for public officials in D.C. school lottery". Washington DC. Retrieved September 17, 2017. ^ Jamison, Peter (March 8, 2018). "A short guide to the D.C. Public Schools scandals". Washington Post. Washington DC. Retrieved March 8, 2018. ^ Devork, Petula (May 17, 2017). "D.C.'s school scandals are barely registering with the public. That shows how little we value education". Washington Post. Washington DC. Retrieved September 17, 2017. ^ Hermann, Peter (February 9, 2016). "D.C. Council unanimously votes to create public campaign finance program letter". The Washington Post. ^ Jamison, Peter (February 5, 2018). "D.C.'s open-government watchdog took her job seriously. Then she lost it". The Washington Post. ^ D.C.’s public hospital needs $17 million taxpayer subsidy, officials say Washington Post, December 12, 2017. ^ Simmons-Duffin, Selena (October 30, 2017). "Timeline: A Quick Guide To Veritas' United Medical Center Contract". WAMU. Washington DC. Retrieved October 30, 2017. ^ Jamison, Peter (August 14, 2017). "Dangerous mistakes led to shutdown of United Medical Center obstetrics ward". Washington Post. Washington DC. Retrieved August 14, 2017. ^ Reed, Tina (October 3, 2017). "Nurses union votes 'no confidence' in United Medical Center leadership". Washington Business Journal. Washington DC. Retrieved August 14, 2017. ^ Jamison, Peter (October 30, 2017). "'Simply unacceptable': D.C. Council members press hospital operator on patient's death". Washington Post. Washington DC. Retrieved October 30, 2017. ^ Jamison, Peter (December 19, 2018). "'Pure incompetence'". Washington Business Journal. Washington DC. Retrieved December 19, 2018. ^ a b Davis, Aaron (October 31, 2015). "More D.C. families are living in homeless shelters at the start of winter than ever before — and it's by design". WashingtonPost.com. Retrieved March 19, 2016. ^ D. C. homeless population drops for second straight year, report finds, Washington Post, May 8, 2018. ^ a b McDermott, Ryan (October 21, 2015). "D.C. mayor's homeless shelter plan lacks transparency, critics say". Washington Times. Retrieved March 19, 2016. ^ Davis, Aaron (February 9, 2017). "District mayor reveals sites proposed for homeless shelters across city". WashingtonPost.com. Retrieved March 19, 2016. ^ Davis, Aaron (October 31, 2015). "D.C. mayor refuses to say how she picked sites for new homeless shelters". WashingtonPost.com. Retrieved February 15, 2016. ^ a b Davis, Aaron (March 16, 2016). "Homeless shelter plan could be profitable for Bowser's backers". WashingtonPost.com. Retrieved March 15, 2016. ^ Nirappali, Firat (May 17, 2016). "D.C. Council head blasts Bowser for 'obfuscation" over shelters; she fires back with expletive". WashingtonPost.com. Retrieved March 15, 2017. ^ Martin Austermuhle. "Words Fly After D.C. Council Alters Plan To Close D.C. General Homeless Shelter". WAMU. Washington DC. Retrieved May 17, 2016. ^ Giaborone, Andrew (February 22, 2018). "Bowser Buddy Joshua Lopez Finally Gets a Seat on a High-Stakes D.C. Board". Washington City Paper. Washington, DC. Retrieved February 22, 2018. ^ Fenit Nirappil; Peter Jamison (April 27, 2018). "At a rally to end divisive politics in D.C., speaker calls lawmaker a 'fake Jew'". The Washington Post. Washington DC. Retrieved April 27, 2018. ^ Mikaela Lefrak. "Bowser Appointee Apologizes For Rally Speaker's Anti-Semitic Statements". WAMU. Washington, DC. Retrieved April 27, 2018. ^ Ackland, Matt (November 17, 2016). "Protesters confront Mayor Bowser over DC immigrant raids; resolution hearing held". Fox 5. Retrieved November 17, 2017. ^ Jamison, Peter (November 19, 2016). "In the District, jitters over impending Trump era". Washington Post. Washington DC. Retrieved May 20, 2018. ^ a b Barbash, Fred (January 21, 2016). "An inch of snow, icy roads unleash 9 hours of traffic chaos across D.C. region". Washington Post. Retrieved January 22, 2016. ^ a b c Devorak, Petula (January 21, 2016). "Forget ISIS. The most powerful city on earth can't handle a dusting of snow". Washington Post. Retrieved January 22, 2016. ^ a b Davis, Aaron (January 11, 2017). "For 1 storm, D.C. spent $40 million on snow removal, some of the funds improperly, audit finds". Washington Post. Retrieved January 22, 2017. ^ Davis, Aaron C. (October 6, 2015). "D.C. Mayor reverses course and backs Pepco-Exelon merger". The Washington Post. ^ Davis, Aaron C. (November 11, 2015). "Opponents of Pepco-Exelon merger call for ethics investigation of Bowser". The Washington Post. ^ Madden, Patrick (December 16, 2015). "Exelon Paid FreshPAC Chairman To Lobby D.C. Government About Merger". WAMU. ^ Nirappil, Fenit (March 15, 2018). "D.C. taxpayers have recently paid at least $735,000 to settle sexual harassment lawsuits". Washington Post. Washington, DC. Retrieved March 15, 2018. ^ GIAMBRONE, Andrew (April 24, 2015). "Bowser Kicks Off First Day of School With "Slow Down" Campaign". The Washington City Paper. ^ DiCaro, Martin (March 31, 2017). "How Is D.C. Doing One Year Into 'Vision Zero' Plan To Eliminate Roadway Fatalities?". The Washington City Paper. ^ Lazo, Luo (March 14, 2018). "Traffic deaths continue to soar despite cities' pledges to get them to 'Zero'". The Washington Post. ^ Lazo, Luo (July 18, 2018). "Bike And Pedestrian Advocates Plan To Protest D.C.'s Failure To Prevent Road Deaths". DCist. ^ Sommer, Will (September 18, 2015). "Bowser: Streetcar Will Run By End of 2015". Washington City Paper. Washington DC. Retrieved September 18, 2017. ^ Laris, Michael (April 1, 2015). "Big challenges in D.C. Mayor Bowser's vow to activate, expand streetcar line". The Washington Post. ^ Freed, Benjamin (December 4, 2015). "The DC Streetcar Won't Run in 2015". Washingtonian. ^ Michael Laris (February 27, 2016). "D.C. streetcar makes its first voyages on H Street. 'Is it really happening?'". Washington Post. Retrieved February 21, 2019. ^ Michael Neibauer (April 1, 2015). "Bowser names cabinet member to focus on development in overlooked communities". Washington Business Journal. Washington DC. Retrieved April 1, 2017. ^ fox5dc.com staff (November 28, 2017). "DC's deputy mayor used city employees to care for child during work, says Inspector General's report". Fox 5 DC. Washington DC. Retrieved November 28, 2017. ^ Peter Jamison (November 27, 2017). "D.C. deputy mayor used employees for babysitting, inspector general finds". Washington Post. Washington DC. Retrieved November 27, 2017. ^ a b Davis, Aaron C. (April 26, 2016). "Mismanagement has bankrupted a D.C. nonprofit, endangering programs for at-risk youths, board members say". The Washington Post. ^ a b "List of Democratic Candidates in the June 19, 2018 Primary Election". District of Columbia Board of Elections. March 22, 2018. ^ "List of DC Statehood Green Candidates in the June 19, 2018 Primary Election". District of Columbia Board of Elections. March 22, 2018. ^ "List of Republican Candidates in the June 19, 2018 Primary Election". District of Columbia Board of Elections. March 22, 2018. ^ "List of Libertarian Candidates in the June 19, 2018 Primary Election". District of Columbia Board of Elections. March 22, 2018. ^ King, Colby (November 7, 2018). "Muriel Bowser won her reelection battle, but she lost clout citywide". Washington Post. Washington, DC. Retrieved November 7, 2018. ^ "Mayoral Primary Official Results". District of Columbia Board of Elections. April 1, 2014. ^ "General Election Official Results". District of Columbia Board of Elections. November 4, 2014. ^ "District of Columbia Election Results". The Washington Post. Retrieved November 16, 2018. ^ Weil, Martin (May 21, 2018). "D.C. Mayor Muriel Bowser says she has adopted a baby". Washington Post. ISSN 0190-8286. Retrieved May 22, 2018. This page was last edited on 4 April 2019, at 14:35 (UTC).